Revised extraxial-axial homologies in Asteroidea. Poster presented at the 14th International Echinoderms Conference, Brussels, Belgium August 2012. 2012. Hotchkiss, F. H. C. Growth zones and extraxial-axial skeletal homologies in Asteroidea (Echinodermata). Proceedings of the Biological Society of Washington 125(2):106-121. An Arm-Stump Specimen of Archaster angulatus Müller & Troschel, 1842 (Echinodermata Aseroidea). Poster presented at the 6th North American Echinoderm Conference, Rosario Beach Marine Laboratory, Anacortes, Washington, August 2011. Abstracts published in Gulf of Mexico Science 29(2):131-158. Pattern formation in starfish: arm stumps, regeneration models and evolution. Poster presented at 5th North American Echinoderms Conference, FIT, Melbourne, FL July 2008; also to be presented at the 4th Workshop of German and Austrian Echinoderm Research, Vienna, October 2008. 2009. 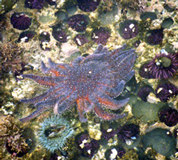 Hotchkiss, F. H. C. Arm stumps and regeneration models in Asteroidea (Echinodermata). Proceedings of the Biological Society of Washington 122(3):342-354. SEM study of isolated ossicles of Paleozoic ophiuroids. This study is made possible by a 2008 Karl Hirsch Memorial Research Grant from the Western Interior Paleontological Society, Denver, Colorado. The use of SEM images is standard and necessary for the study of ophiuroid ossicles. The use of stereo-pair images is especially important because of the difficulty of adequately describing the complex high relief articulations of the vertebrae [arm ossicles]. The materials include isolated vertebrae of the fascinating Mississippian age ophiuroid Onychaster flexilis donated by F. Rudolf Turner, and also some unidentified ophiuroid vertebrae from the Devonian of Germany and of the Czech Republic. The articulation surfaces of ophiuroid vertebral ossicles are complex and contain information of behavioral, ecological and taxonomic significance. The SEM images from the WIPS grant will provide a basis for conducting a longer term and more detailed study. Such studies depend on the good luck of obtaining specimens of body fossils that provide favorable views of individual ossicles that can place the isolated ossicles into the context of the whole animal, its behavior and its ecology. The ophiuroid Onychaster is fairly famous from being found perched on the crown of crinoids specimens from the Crawfordsville, Indiana, crinoid beds. However there is a history of disagreement on whether it is a euryalid or a non-euryalid ophiuroid. Therefore learning more about the structure of Onychaster arm vertebrae using modern SEM techniques on exceptionally well preserved isolated ossicles will be an important result from this grant. The ossicles from the Czech Republic are studied in collaboration with Dr. Rudolf J. Prokop, Museum of Natural History, National Museum, Praha, Czech Republic, and Vaclav Petr, Research Associate of MPRI, Praha, Czech Republic]. Work in progress 2008. Diminutive ophiuroids from the upper Windsor Group (Lower Carboniferous: Late Viséan/Asbian) of Nova Scotia, Canada. F.H.C. Hotchkiss, MPRI, in collaboration with P. von Bitter, Royal Ontario Museum, toronto]. 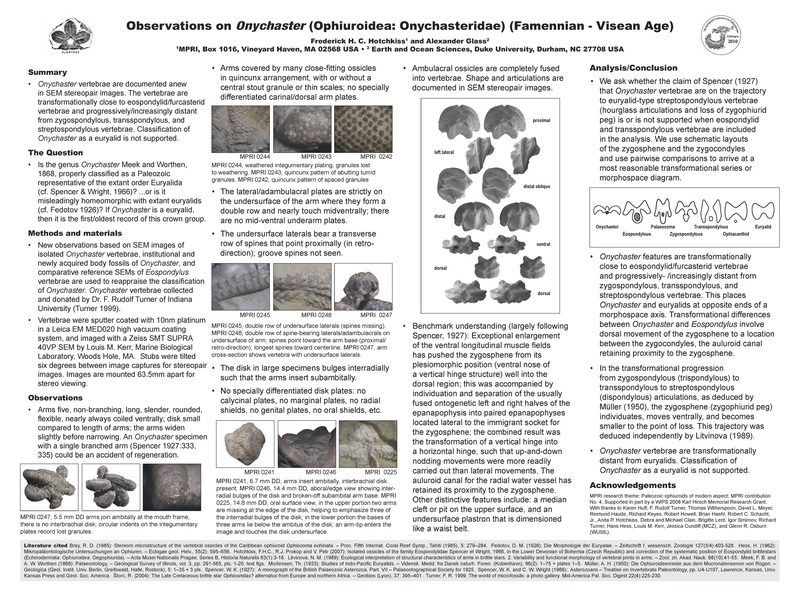 Poster presented The Eighth Canadian Paleontology Conference, Collingwood, 22-25 October 1998 [CPC Program and Abstracts No. 8, p. 11 (abstract)] [presented also at Royal Ontario Museum Twentieth Annual Research Colloquium, 18 November 1998, Toronto, Abstracts of Papers, p. 8 (abbreviated abstract).] Work in progress June 2008. Pliocene ophiuroid bed, Baja, Mexico. René Lewis (Department of Geography and Geology, University of North Carolina, Wilmington). Link to project details page is under development. Bdellacoma in the Hunsrück Slate (Lower Devonian, Germany): Reidentification of Urasterella verruculosa (Asteroidea, Bdellacomidae) [Alexander Glass, Department of Geological Sciences, Central Washington University, Ellensburg, WA and F. H. C. Hotchkiss, MPRI] Poster [approx. 16MB PDF, approx. ten minute download]. This is MPRI contribution No. 2, prepared for the 12th International Echinoderms Conference, UNH, Durham, 7 - 11 August 2006. Conference proceedings are still in process of publication (June 2008). Starfish arm stumps: wound closure patterns and regeneration models. Work in progress April 2008. This is MPRI contribution No. 3, prepared for the Fifth North American Echinoderm Conference, Melbourne, Florida, July 2008, and also the 4th Workshop of German and Austrian Echinoderm Research, Vienna, October 2008.